We got off to a great start by eating Argentinian pastries and juice. We went on a sight seeing tour and brought along some Austrian/German friends. Our first stop was a giant metal flower that opens up during the day and closes in the nights. Next, we went to Recoleta Cemetery, where we say Eva Perón’s grave. Then, we took our bus to La Boca, where we were able to walk around and take pictures of the neighborhood. Our last destination was an antique market, where we also ate our lunch. After walking back to our hotel, we relaxed and packed our bags. At 7:15pm, we boarded our overnight bus to Misiones. It was awesome! The front and top of the bus made for beautiful views. The food was weird (mostly), but we ate it all happily! 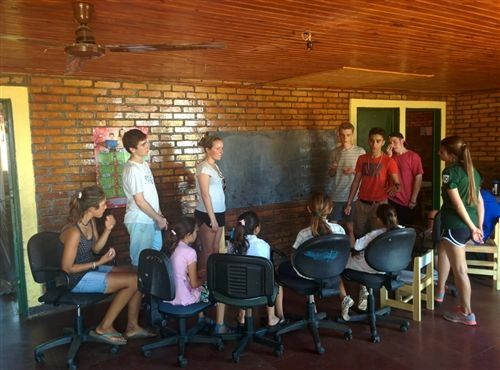 We look forward to updating you about our time in Misiones! We arrived in the overnight bus at our hotel, which is family owned/operated and very dog friendly (to our pleasure). We then journeyed to an agricultural based high school. The scholars can stay an extra year to specialized for a future career in farming. We were fortunate to receive a tour of the school's facilities which included chicken coops, bunnies, and pigs. As we strolled throughout the campus, we observed the extensive and very beautiful landscape. We ended at the pig stalls which featured baby piglets scurrying about the mama pigs (And some freakishly large hogs). Marco, Cido, and Jorge met up with us to guide us in our farming experience with an awesome amount of enthusiasm. From the compost, we shoveled and bagged fertilizer for our flowers to plant. After loading up the truck, we explored the pond where we fed (and Zack touched) the hundreds of carp. We drove to where we would plant flowers into pots, after which we played volleyball with some of the younger students for their first P.E. class. We stopped for ice cream and then cooled off by the pool and showers and dined together in the lobby. As the day came to a close, we planned for our next adventure with excitement and anticipation. On Wednesday, we woke up to a beautiful morning in Providencia de Missiones. After a delightful breakfast, we heading out to El Puma, a rehab center for animals. It was sadly hit by a tornado in December. Animals got killed and many ran away because of destroyed habitats. It was sad seeing the shape that the preserve was in. Willing to help in any way, they decided the best thing for us to do was help organize the fallen trees. We cleared the brush off of the path and gathered all the large trunk sections. Under a big log slept a large, hairy tarantula. We then had the privilege of seeing beautiful animals. After visiting El Puma, we went to the ruins of a Jesuit mission. It was truly incredible. After that, we got delicious ice cream and went back to the hotel. We finished the night off right - a nice barbecue and band performance.